Egg Harbor Marina has 63 stationary year-round floating piers. A mix of sizes includes 50’(3), 45’(2), 40’(14), 35’(17), 30’(15), and 25’(12) slips. In addition, there are six wall slips, four end piers and numerous courtesy piers for short term use. The marina can accommodate seven to ten overnight transient vessels, depending on their size and easily harbor a transient boat up to 75 feet. However, a 90 foot boat has visited the new fuel dock. Daily, yearly, or commercial fees are available. The majority of the marina’s piers are in 10 to 16 feet of water but the harbor entrance is 20 feet deep and the outer edge of the main breakwall is 25 feet deep. Sailors love Egg Harbor for its deep waters and lack of obstructions. The pedestrian walkway, on top of the breakwall, is approximately 800+ feet long (1/6 of a mile). The rubble mound breakwall is constructed of quarried stone from Wisconsin; mostly from near Sturgeon Bay. The large red armor stones made of red granite came from Wausau. They each weigh between 3 and 5.5 ton and were delivered to Green Bay by truck and then to the marina by barge. The outside edge of the breakwall has two layers of granite and one on the inside. Each piece of armor stone has a blue dot that represents its quarry inspection and a blue number that displays weight of the stone. Everything below the water and much above is brand new. The entire rebuild project was completed in less than a year and cost approximately 6.5 million dollars. 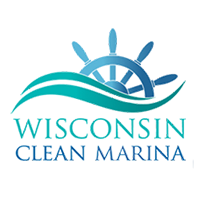 Financing was provided by local taxpayers, the sale of bonds and generous grants from the Wisconsin Waterways Commission. 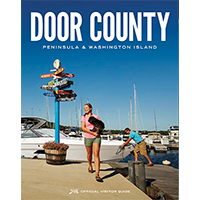 The marina was built with pride for your recreational enjoyment and to promote safe boating. 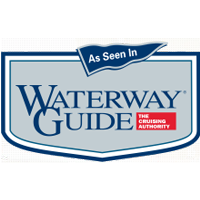 We are honored that the marina has been designated a “Harbor of Refuge.” Welcome Aboard!